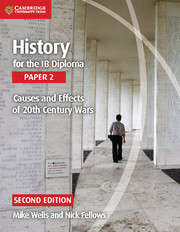 Comprehensive second editions of History for the IB Diploma Paper 2, revised for first teaching in 2015. This coursebook covers Paper 2, World History Topic 11: Causes and Effects of 20th Century Wars of the History for the IB Diploma syllabus for first assessment in 2017. Tailored to the requirements of the IB syllabus and written by experienced IB History examiners and teachers, it offers authoritative and engaging guidance through the following detailed studies from around the world: the First World War, the Spanish Civil War, the Second World War, the Chinese Civil War and the Iran/Iraq War. 1. Introduction; 2. The First World War; 3. The Spanish Civil War; 4. The Second World War; 5. The Chinese Civil War; 6. The Iran/Iraq conflict; 7. Exam practice; Further Information; Index.